Have I mentioned how much I LOVE the new Four Feathers set? I really do! I love the designs of the feathers and matching framelits is ALWAYS good! This is a card I did for the latest Control Freak Swap! This is also the set I used for my cards for this week’s Create with Connie and Mary Holiday Card “Create”tions. (But you have to be a subscriber to see my card set…it’s NOT TOO LATE…subscribe today!). Lots of fun ‘new stuff’ on here! All is Calm – 3/4 x 3 5/8…add along bottom. Add strip of All is Calm Washi Tape and trim around corners. Add Lost Lagoon large leaf (just use framelit to cut out). Stamp large leaf using Versamark on Basic Black and silver emboss, stamp small leaf on Whisper White using versamark and silver emboss. Cut out both. Light add lightest Coastal Cabana Blendability to center of white leaf. Layer leaves and add using dimensionals. 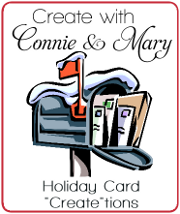 What a GREAT week 1 we are having on the Create with Connie and Mary Holiday Card “Create”tions! This time we are doing an ALL CARD collection…how cool is that??? You don’t want to miss it! This week is all about Fall/Halloween and you can get 3 week of all cards (1 week Halloween/Fall and 2 weeks Christmas) for only $19.95! I know I can hardly wait! AWESOME!!! So head over to Create with Connie and Mary to learn more and subscribe today! 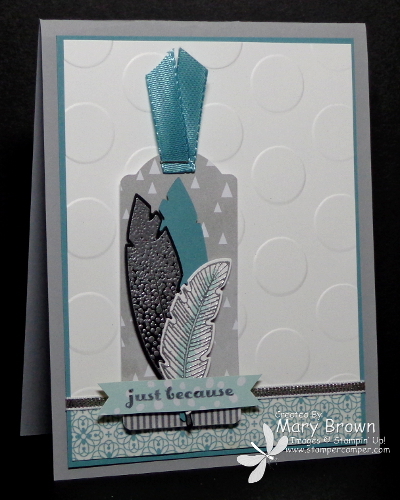 This entry was posted in Create with Connie and Mary, Swap and tagged And Many More, Four Feathers. Bookmark the permalink.